In Part 1 of the topic Why Your Dog is So Full of Energy and How to Put it to Use we talked about why dogs are so full of energy, and how it is a mixture of their wolf heritage and the fact that they have been bred for hundreds of years to help mankind with important jobs that require them to go, go, go. I also promised you a list of dog sports and I am going to fulfill that promise right here. Just like with humans, before starting any sport, make sure that your dog is in good medical condition and able to participate. I do not want any dogs to get injured or worse, so please make sure that you are not asking a couch potato pooch to suddenly be ready to set record agility times or start pulling sleds until they are physically ready. Partner with your veterinarian before you and your dog start an exercise program or new sport as she or he will be able to help you determine if your dog is ready and how to prepare and condition for the activity. In the sport of agility, dogs race through a series of obstacles like jumps, ramps, tunnels and other things at the direction of a human handler. Their goal is to complete all of the obstacles in the best time with as few mistakes as possible. Purebred dogs and mixed breeds can participate and you can compete or just do agility for the fun of it. Border collies and other medium-sized super fast dogs do great in agility, like in this video: https://youtu.be/JL8CbCryZs4. I love to see non-traditional types of dogs doing agility like this Mastiff in this popular YouTube video: https://youtu.be/GjqtwNUE148. Check out the AKC Agility page for information on how to get started: http://www.akc.org/events/agility/. Definitely take classes through a local dog training facility, as agility can be hard on a dog’s joints, so you want to make sure to do it correctly from the start. According to the K9 Nosework site, “dogs learn how to search for a specific odor or odors and find the source. Dogs start by searching for their favorite food or toy reward hidden in a variety of environments, increasing the challenges and adding new search skills as the dog progresses.” This is a great low impact activity that you can do just for fun or competitively; it’s open to dogs of all shapes and sizes, and will definitely work their brain. It is also fantastic for the dog/owner bond. You can learn more at these links: http://www.k9nosework.com/about-us/what-k9-nose-work and https://www.ukcdogs.com/nosework. Just like Agility, many dog training centers are offering K9 Nosework classes if you are ready to get your dog started on a fun activity. In Rally Obedience, the owner and dog go through a course consisting of obedience commands, doing a different command at each station. Here is a great video demonstrating two Labradors competing in Rally: https://youtu.be/rnfPOebctCQ. This is another activity like K9 Nosework that is more mental than physical, so it is not as demanding on your dog’s body. Rally is another activity with classes offered at many training facilities. The AKC website offers information on getting started: http://www.akc.org/events/rally/getting-started/. Any breed or mix of breeds can participate in Barn Hunt, in which dogs search for rats that are safely protected in aerated tubes. The only criteria is that dogs must be able to fit through an 18″ wide tunnel that is as high as a bale of hay. Check out more at this link: https://www.barnhunt.com/faq.html. Rats are in no way harmed in this sport. According to the information on the site, the rats used are often beloved family pets and they are safe and sound in the tube. In this sport dogs are harnessed to a weighted cart using special equipment designed for the sport to pull the cart and perform obedience routines and maneuvers. Please make sure you use the correct equipment to avoid injury and never hook a cart or sled up to your dog’s collar. Here is some basic information on carting at this link. In this sport owners toss flying discs to their dogs in a variety of types of competitions. This is a very physical sport, so please check with your vet to make sure your dog is not too young and in good enough physical shape to participate. There is some great information at this link: http://www.discdogg.com/disc-dog-training/. If your dog loves the water, dock diving is a fun sport in which dogs jump for distance or height from a dock into a pool or body of water. You can often find dock diving events in your local area each summer and some of them allow you to enter your dog the same day as the event and have a few practice jumps before competing. Here is some helpful information for beginners: http://www.splashdogs.com/events/Newcomers.php. Hiking with my late Babe was one of my favorite things to do. We often hiked through the Indiana Dunes National Lakeshore. It is important to be prepared for emergencies, especially if you live in an area with poisonous snakes or other animals that could harm you or your dog. Here is a fantastic guide from online magazine My Open Country: Hiking with Dogs: Bringing Your Best Friend. In obedience trials, dogs and owners demonstrate skills like heeling on and off leash, long sit, long down, recall, standing for a physical exam and other skills, depending on the level of the trial. Here is information on how to get started in obedience trials: http://www.akc.org/events/obedience/getting-started/. 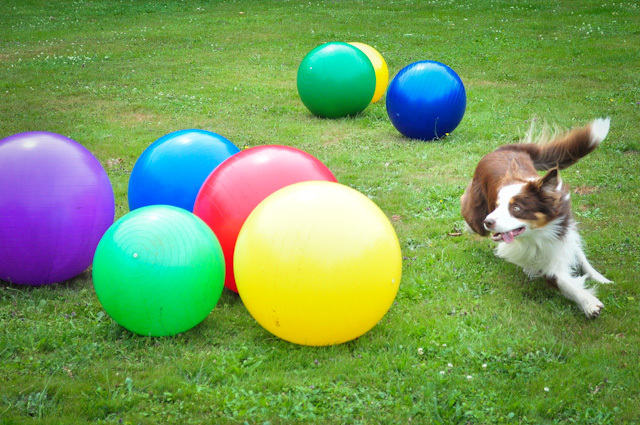 What dog wouldn’t love pushing a giant exercise ball across a field or room? This looks like the best game in the world, and I have to admit I had forgotten about it until researching this blog! There is definitely training and skill involved, though. Check out the American Treibball Association for tons of information http://www.americantreibballassociation.org. “Oh my gosh, I’ve always wanted to teach the dogs to dance!” I exclaimed excitedly, thinking about our German Shorthaired Pointer named Dutch. “What?” he said, giving me the confused look that I see often on his face after I speak. “Dog dancing! I’ve always wanted to teach Babe or Dutch how to do that!” I said. What I was talking about was Musical Canine Freestyle, in which you perform obedience and tricks to music with your dogs. Here is a very advanced version of this sport: https://youtu.be/yRrHGmc9Ojs. Here is a more basic beginner version: https://youtu.be/6ZO7Qc4dYuU. There are all sorts of other things to do with your dog, like training for the Canine Good Citizen test and title, working toward becoming a therapy dog or reading dog. There are sports like hunt tests for retrievers and other sporting group dogs, herding for herding dogs, Flyball, Mushing, Skijoring for people who love to cross-country ski and want to add their dogs to the fun. Weiner dog races for Dachshunds, lure coursing for sight hounds, Tracking Trials for dogs with great noses, and all sorts of breed specific things that are fun for both you and your dog. The best thing about putting your dog’s energy and brain to use is that you get to do it with them, so not only do you have a happy, calm, satisfied dog, you have worked with her or him to learn the activity. We are best friends with dogs because we work and play so well together, and any time you and your dog are training together, working on a common goal, going out on adventures together, your relationship is going to be that much stronger, that much closer. You will likely find that when you do want that much-needed down time in front of the TV at the end of a long work day that your dog is more cuddly and close to you at those times, too, and not just when you are at play.